The range of tractors from the Marshall brand was well represented with the earliest model being a 12/20 owned by Michael and Linda Babbings. There were a nice number of Model M’s for it’s 80th birthday, including a nice example in its as found condition that had travelled up from London, one in non-standard blue livery owned by Andy Parker through to one in a beautifully restored concours finish owned by Bob Shaw. Every marque of the Field Marshall range was well represented from the Series 1 through to the 3a and the gathering also saw crawlers from both the Fowler and Marshall group. 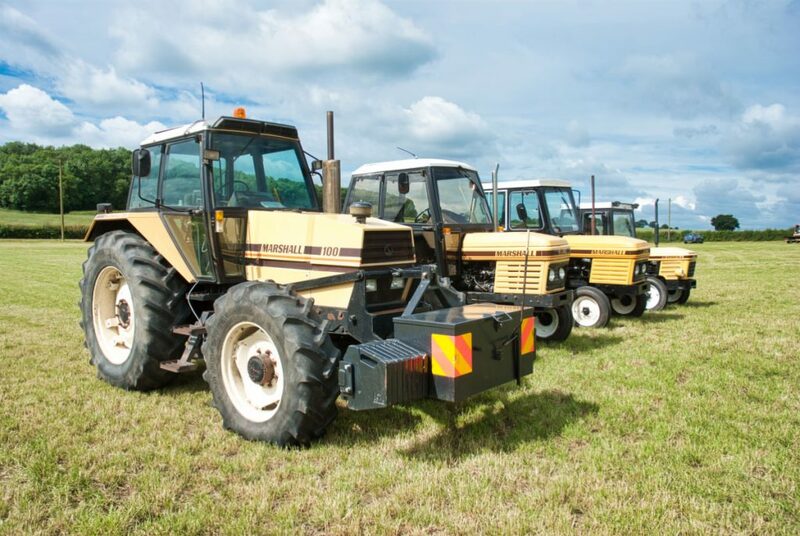 A nice feature of the event was the small collection of the later Harvest Gold wheeled tractors represented by fine examples of the Marshall 100 4×4, Marshall 802, Marshall 502 and the smaller Marshall 302. All of these were in great condition and are becoming more and more popular on the rally circuit. They were joined at Marshall’s Yard on the Sunday by another example, the Marshall 702 which looked as if it had just left the factory. The event also saw the gathering visit Owston Ferry Pumping Station to see the superb 108 year old ‘LT’ class horizontal, compound, tandem steam engine built by Marshalls & Sons of Gainsborough driving 24 inch Drysdale centrifugal pumps which were made in Glasgow. Originally one of a pair, this engine is believed to be the only one of its class still in its original in-situ location, formally powered by two Marshall Cornish boilers it is currently run via an electric motor as these have been deemed economically unviable for repair. However, there are plans in motion to once more power the engine by steam from a modern boiler and the group are now awaiting approval for this to be run on public open days. 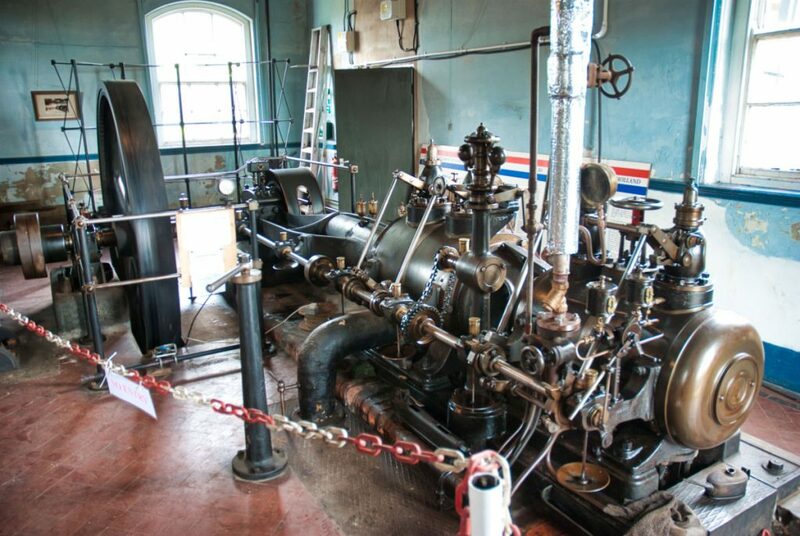 The pumping station also houses a Ruston & Hornsby, twin cylinder, size 8, ‘HRC’ class diesel engine which could develop 94 BHP at 290 rpm (revolutions per minute). Well worth a visit if you are in the area on one of their opening days. In the evening Bridget Laycock of the Marshall Club provided a slideshow of all things Marshall to all those still in attendance. The following day saw everyone up and about relatively early (for a Sunday) and keen to run the tractors into Gainsborough for the usual Father’s Day Road Run. A number of the tractors set off on a beautiful sunny morning into the village of Beckingham before crossing the fields to arrive close to Trent Bridge. As they arrived in the town to once more have the streets of Gainsborough singing to the pop pop of the diesel engines, it wouldn’t have been a Father’s Day run without passing and paying their respects to Britannia at the works. 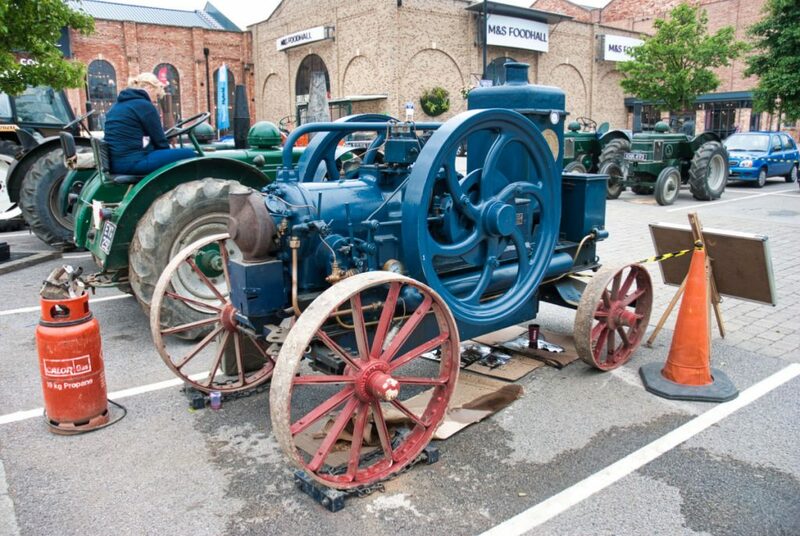 There were a number of other tractors already awaiting their arrival in Marshalls Yard which of course is the site of the old factory, with a special guest appearance by the Marshall ‘S’ Type Hot Bulb Stationary Engine. Now back on its original steel wheels it had been a good few years since its last appearance back at its birthplace. As well as celebrating the aforementioned anniversaries the Marshall Club was also at Marshalls Yard to recognise two of its stalwart members, Jeff Bloom and club founder Peter Anderson. 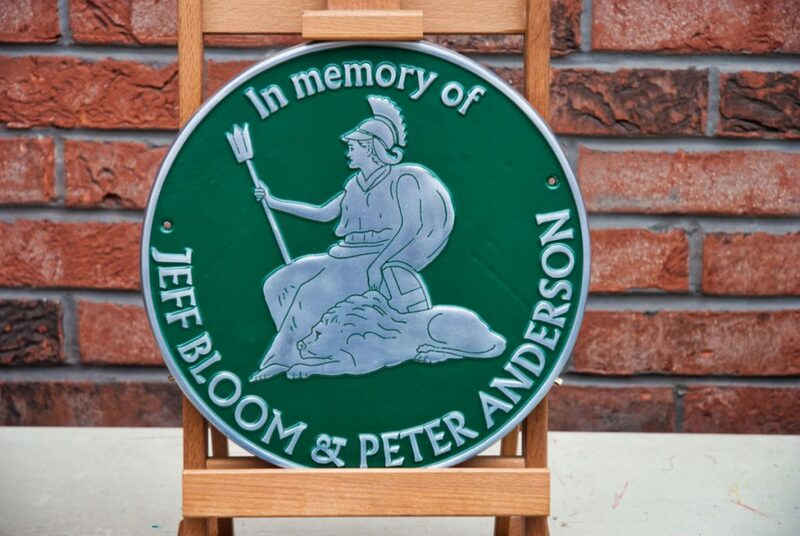 The plaque in memory of the two Marshall men was the brainchild of friends of both men and club members Michael and Linda Babbings who also sourced and sponsored the plaque and the design was implemented by model maker David Brook. The unveiling was held in the presence of a great many enthusiasts with a guard of honour from three very special tractors Field Marshall Series 3a no. 17329 XFO 345/IR 8057 once owned by Jeff Bloom and now owned by the Bloom family, Field Marshall Series 3 no. 12663 EFX 408 at one time owned by Peter Anderson and Jeff Bloom and again now owned by the Bloom family and Model M no. 1174 once owned by Peter Anderson and now owned by Paul Ducksbury. The unveiling was held under the old Steam Crane at the entrance to Marshalls Yard and it is here that the plaque is now located. Kelly Bloom and Ross Anderson, brothers of the two modern authorities of Marshall’s being commemorated did the honours to rapturous applause. 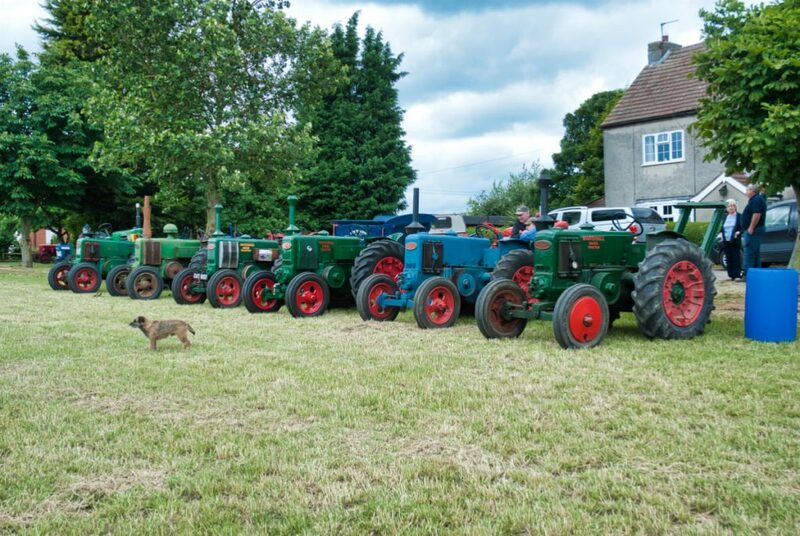 Once again the Father’s Day event was well supported by tractors, enthusiasts and the general public some of whom were also extended VIP visits to the Gainsborough Heritage Centre. The weekend culminated with a fitting end to any birthday celebration and the cutting of a lovely cake resplendent with the Marshall logo provided by Andy & Lynne Birkitt as surprise for Bridget. Andrew is a founder member of the Gainsborough Heritage Association and current Chairman, his passion for the towns past has led him to be studying and researching its rich heritage for over 30 years and he likes nothing more than getting into a conversation on Marshalls or Rose Bros.
Gainsborough Heritage Association works to help preserve Gainsborough’s history and heritage for today and tomorrow. We’re a registered charity (No: 1077538).